It’s certified organic (this is also a requirement for Bird-Friendly certification). As a family-owned farm, Finca Nueva Armenia doesn’t qualify for Fair Trade certification, which only covers small farmers that are part of a cooperative. However, this coffee is Counter Culture Direct Trade Certified, in which Counter Culture pays a minimum price that is well above the Fair Trade floor price, plus quality incentives. Price and other aspects of the program are certified by a third party. Finca Nueva Armenia has remained consistently delicious the last several crop years. 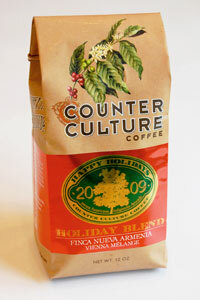 So I was thrilled to find out that Counter Culture has decided to use this coffee as their 2009 Holiday Blend. As they have done in the past, Counter Culture’s “blend” is not composed of coffees from different origins, but a single origin roasted using a European technique called Vienna Mélange, in which different roasts are mixed and blended. You can read more about this technique here. This year, for each bag of Holiday Blend sold, Counter Culture will be donating $1 to a native tree-planting project. Acting on a suggestion by the SMBC, the Recinos, owners of Finca Nueva Armenia, want to incorporate more fruit-bearing and canopy trees in the coffee production areas. These funds will help cover costs of collecting seeds from native trees, raising them in their nursery, and planting and tending them. So far, they have 7500 seedlings. I want you to support this tree-planting effort; support the Recinos family’s commitment to growing organic, shade-grown, Bird-Friendly coffee; and I want you to try this fine sustainably-grown and sourced coffee. For every bag of the Finca Nueva Armenia Holiday Blend purchased by a Coffee & Conservation reader from now through December 21, 2009, I will donate $1 to the Smithsonian Migratory Bird Center*. The Holiday Blend is $11.75 for a 12-ounce bag. That’s $0.65 for a cup of great coffee. Counter Culture is now offering a $3 flat rate shipping for all orders — so even if you only order a single bag, it is still only $0.82 a cup (calculate it here yourself). Order it here, and put your money — and mine, and Counter Culture’s — where our hearts are: in support of a great future for great coffee and the birds and biodiversity that depend on it. UPDATE: I rounded up and contributed $50 to SMBC…I wish more people had cooperated, and am up for ideas on how to run a similar promotion next year. *The Fine Print. Send me a copy of your order via email (coffeehabitat AT gmail.com). I’ll just note how many bags of the Holiday Blend you purchased so I can keep track, then I’ll delete it. It does not contain your credit card information (but feel free to strip out the payment section if you like) and I won’t save any of your personal information. I am a modestly-compensated ecologist, so I’ll have to cap this at $250, but feel free to make me fork over every penny. Does anybody care to join me in this effort with a match in part or whole? Send me an email! This promotion was entirely my idea, and I am not receiving any compensation for this promotion from Counter Culture. maybe off topic but http://akam1k3.blogspot.com/2009/11/our-craving-for-meat-makes-rainforest.html please check out the video we made. what do you think. save the rainforest. thanks. leave a comment if u like.